Just snap the wires into the DB9 shell - no soldering! Use these handy adapters to easily customize interconnections between DB9 and modular connectors. This is often useful in serial communications equipment when transitioning between connector styles. 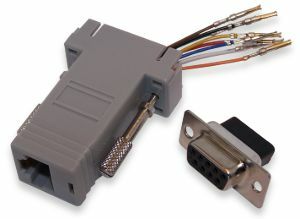 Each adapter kit comes with the RJ connector preinstalled and wired with DB9 pins crimped onto the ends of the pigtails (as pictured above). Simply snap the pins into the DB9 housing to achieve the desired wiring connections between the DB and RJ connectors. Then snap the DB9 connector into the plastic adapter housing, and the adpater is ready to install and use. No soldering required! The pigtail wires that come attached to the modular jack are color coded according to the modular jack pin number to which they are connected. This allows you to easily build the pin mapping that you want by inserting particular color wires into whatever DB9 pin slots you need, based on your application. The color codes for the two different modular jack styles are shown below.